Police are investigating the deaths of four newborn babies who died within 90 minutes of each other in an intensive care ward in South Korea. The babies all went into cardiac arrest while lying in incubators at Seoul's Ewha Womans University Medical Centre. 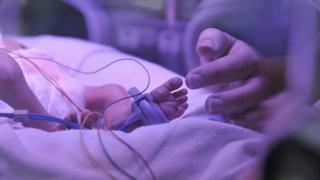 Staff performed CPR but efforts to revive the babies were unsuccessful, a hospital official said. Family members told local media they were concerned about the health of the infants before they died on Saturday. They said the babies all had bloated stomachs and difficulty breathing. Hospital staff say they do not know what caused the cardiac arrests but told police they did "not seem to have originated from a contagious cause." Officials said the four babies had already died by the time police arrived at the hospital, which is in the Mok-dong area of western Seoul. The 12 remaining babies who were in the intensive care unit at the time of the incident have either been discharged or transferred to other hospitals. Police have been searching the hospital. They said autopsies are expected to be conducted on Monday to determine the babies' cause of death. South Korea has spent about $70bn (£53bn) trying to boost the country's birth rate over the past decade, handing out baby bonuses, improving paternity leave and paying for infertility treatment.